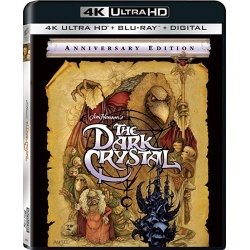 In another time, The Dark Crystal - a source of Balance and Truth in the Universe - was shattered, dividing the world into two factions: the wicked Skeksis and the peaceful Mystics. Now, as the convergence of the three suns approaches, the Crystal must be healed, or darkness will reign forevermore! It's up to Jen - the last of his race - to fulfill the prophecy that a Gelfling will return the missing shard to the Crystal and destroy the Skeksis' evil Empire. But will young Jen's courage be any match for the unknown dangers that await him? Revisit this masterful fantasy epic from the brilliant imagination of Jim Henson.